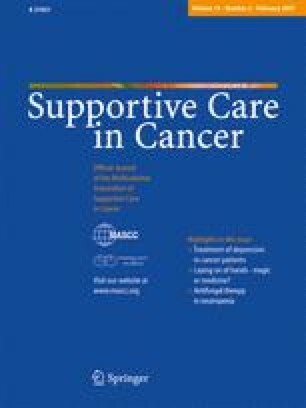 To determine whether the impact of “laying on of hands” on the well-being of patients with advanced cancer is more efficient when performed by a person with self-declared “healing powers” as compared to an actor mimicking the healer in close detail. A total of 80 patients were registered to participate in a randomized, single-blind phase III trial to evaluate the difference in efficacy of “laying on of hands” by either a “healer” or an actor. Each group consisted of 40 patients, scheduled to receive treatment for 5 min, three times a week. The effect of treatment was measured using a “Well-Being scale”, with the difference of the average score of the “Well-Being scale” on day 10 being defined as primary and that on day 5 as secondary endpoint. There was no significant difference in average score values between the “healer” and the actor with regard to the primary (p = 0.34) or the secondary endpoint (p = 0.94), but the comparison was limited due to major protocol violations by the “healer” who unblinded his status after the first run and quit the study. The study was completed by the actor as a descriptive, explorative study on the impact of “laying on of hands”. A significant improvement in symptoms after treatment was found on day 5 (p < 0.001) and on day 10 (p = 0.0002). “Laying on of hands” resulted in a significant improvement of cancer- or cancer-therapy-associated symptoms. The magnitude of improvement obtained was similar whether on a self-declared-healer- or an actor-provided “treatment”. This work was supported by the Austrian Forum Against Cancer. The authors thank Dr. Susan Etlinger and Silvia Bakos for carefully reading and correcting the manuscript.